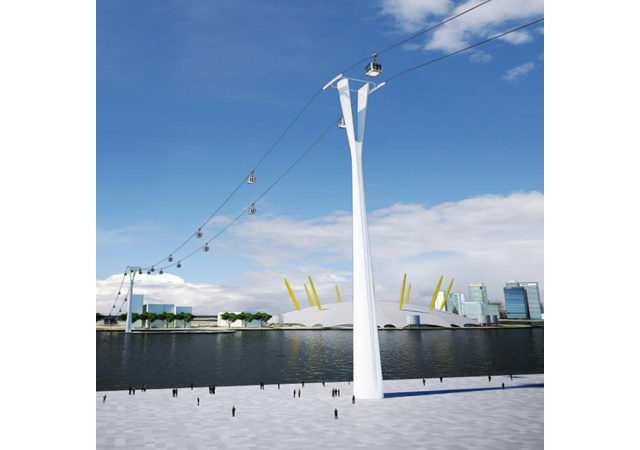 The planning permission application for a cross-river cable car, linking the Greenwich peninsula with the Royal Victoria Docks, has been submitted to Newham council, reports London Reconnections, after spotting the document on the council's website. The 1,100m route was mooted earlier this year by Transport for London, partly as a way of ferrying people around Olympic venues (principally ExCel and the O2) and also providing a permanent link between the north and south banks of the Thames at a part of the river with few crossings. There's still no guarantee the thing will ever get built, but at least this bit of bureaucratic necessity suggests that it's slightly more substantial than a piece of moon-eyed TfL fancy. More details on the planning permission application at London Reconnections.